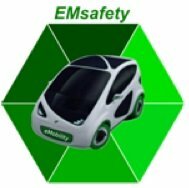 The project aims at increasing the public confidence in the safety regarding electromagnetic fields (EMF) in the fully electric vehicles (FEV). Public expectations to move towards the electrification of road transport are driven by a multitude of factors and concerns including: climate change, primary energy dependence and public health as well as cost and scarcity of raw materials. On the other hand, there is widespread public concern regarding the possible adverse effects of electromagnetic fields (EMF). Thus, there is a need to avoid the spread of panic or unjustified fears that would delay the enormous and crucial economic and environmental benefits that the FEV can provide when deployed on a large scale. The project includes, therefore, a study of existing EM-fields in electric vehicles under certain driving conditions as well as simulation work based on these measurements. These inputs are used for minimizing EMF in electric cars as well as for studies of their effect.